An interesting and accessible introduction to ethical issues raised by various forms of human use of animals. This textbook avoids moral lecturing and presents a range of ethical viewpoints without defending or applying any specific stance. Readers are encouraged and provoked to reflect for themselves, and to sharpen their own points of view regarding the ethical limits on our use of animals. They will also gain further understanding of the views held by other people. 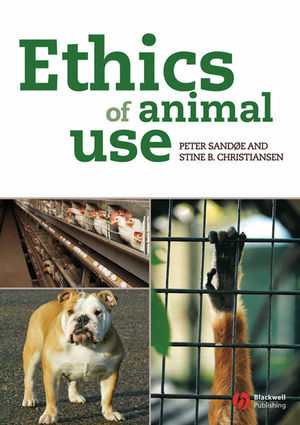 Early chapters of this interdisciplinary book cover changes over time in our view of animals, the principles of animal ethics, and different views of what counts as a good animal life. Later chapters apply the conceptual tools to specific issues including: food animal production, advanced veterinary treatment of pets, control of infectious diseases, wildlife management, as well as the use of animals in research. Specifically designed for students of veterinary medicine, animal science, welfare and behaviour, and veterinary nursing. Also of interest to those wanting to combine an up-to-date, science-based account of animal issues with clear-headed moral reflection. "The book covers an impressive range of topics with accuracy and fairness. Despite its ambitious scope, the authors have achieved remarkable unity in the book, and have produced a book that is easy and pleasant to read. Their work will surely provide a major tool for rationalizing the debate about the ethics of animal use, and I commend them for their invaluable contribution." From the Foreword by Professor Bernard Rollin, Colorado State University. Peter Sandøe is trained as a philosopher and is currently professor of bioethics at the University of Copenhagen, Denmark. Stine B. Christiansen is a DVM and MSc in applied animal behaviour and welfare and is currently doing her Ph.D. at the University of Copenhagen. Both authors have engaged in interdisciplinary research on animal ethics for a number of years. They have advised politicians on animal issues and contributed to the public debate. In addition, they have been involved in setting up and teaching a compulsory course in animal ethics for veterinary students at the University of Copenhagen.